While the trend to switch from regular cars to SUVs looks like it will never end, there’s a growing number of people already looking at the next big thing. And I really do mean big. Pick-up trucks aren’t new but, apart from a brief period in the 90s, they’ve never really managed to hit the mainstream. There’s been good models (the Nissan Navara) and bad models (the Great Wall Steed) but there has never been anything appealing enough to get drivers out of their premium brand cars and into something more agricultural. It’s a big thing, even longer and wider than the Nissan Navara chassis on which it’s based, which makes it something of a behemoth on UK roads but not unwieldy. That was until Mercedes revealed its X-Class. More than just a glitter covered facsimile of a what a pick-up should look like, the Mercedes really is a proper workhorse. Behind that five-seater cabin lies a load bed that will take 1,066kg of cargo, while jacked up suspension means it’ll clear most off-road obstacles. There’s switchable four-wheel drive (it sits in a more economical rear-wheel mode unless switched) and even a low-range box for serious off-road work. 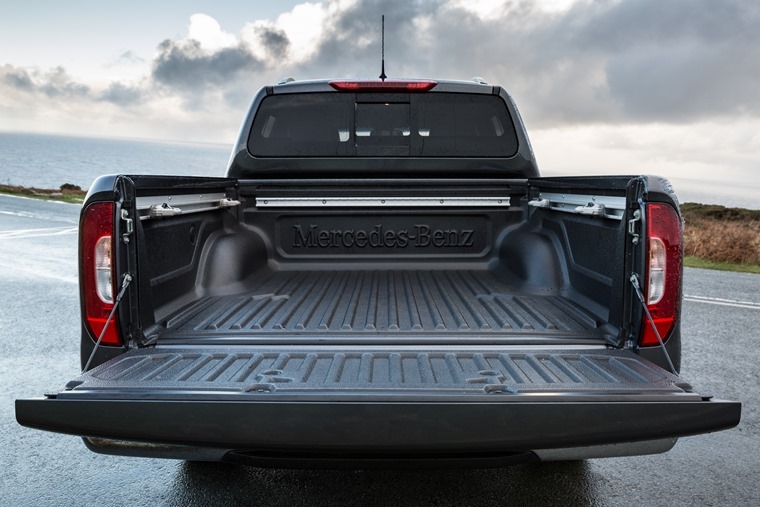 A suite of electronic aides also keeps it moving, including hill descent control that will attempt to defeat gravity and keep the X-Class under control while dropping down the steepest and muddiest of hills. After eschewing the tarmac roads and venturing through some forests near Bala, Wales, there’s no doubt that the X-Class will go further than the huge majority of customers will ever dare take it, and even more impressive it did it all on road tyres designed for summer driving. It’s a big thing, even longer and wider than the Nissan Navara chassis on which it’s based, which makes it something of a behemoth on UK roads but not unwieldy. Narrow Welsh roads feel just about wide enough, thanks to clear sight lines from within the truck that allow you to place the X-Class more or less exactly where you want it. It’s a fine handling pickup, but those moving from cars might be a little alarmed. Those huge tyres will protest very early if requested to corner at anything more than moderate speeds, and the back end can lose traction quickly when it’s unloaded even with the traction control turned on by default. Stopping takes a little more time and effort than drivers might be used to as well. 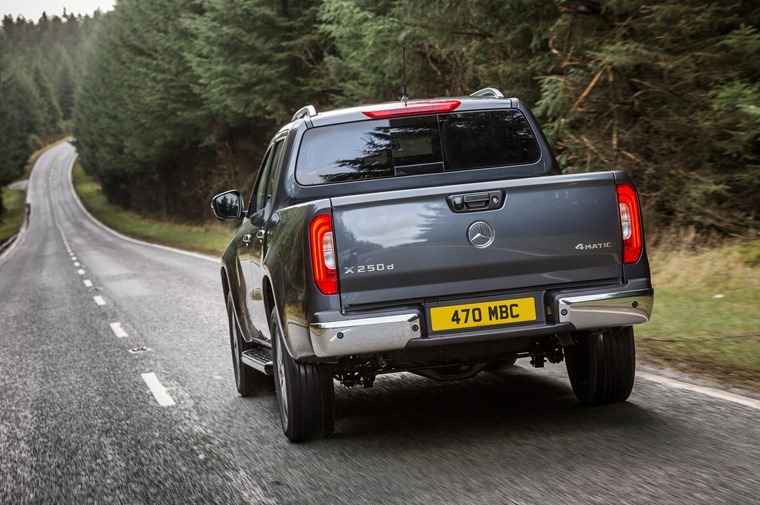 The X-Class might not be the sharpest handling pick-up truck on sale, but it’s still a machine that can weigh north of six tonnes when fully loaded and towing a trailer, so buyers need to be aware of the dynamic limitations that come with that ability. Outright performance is slightly limited thanks to a 2.3-litre diesel engine again provided by Nissan. It’s powerful enough for the truck to keep up with traffic, and sprints from 0-30 very quickly, but it runs out of puff soon after which leaves overtaking needing a lot of planning. The seven-speed automatic gearbox that virtually every X-Class will have is smooth enough, but it’s tuned for economy which means there’s a delay every time you need a little more power as the gearbox changes down a ratio. Plenty of soundproofing around the engine bay and cabin means it’s a quiet cabin though, far removed from the agricultural environment you might expect. 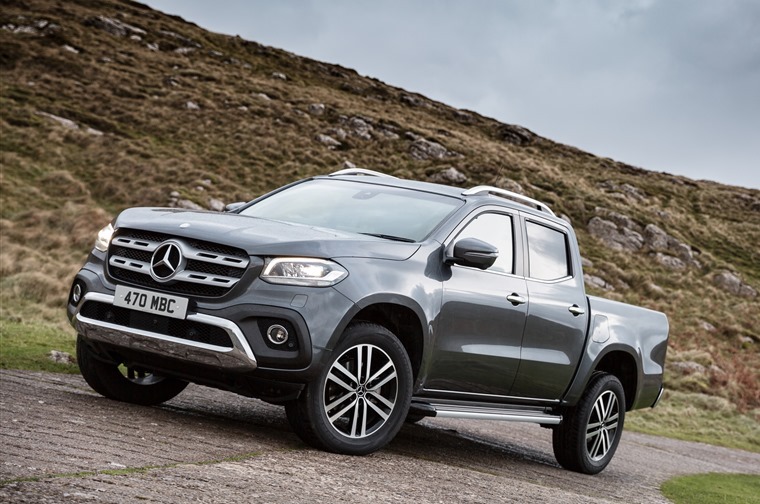 However, a lot of buyers are waiting to make things even smoother and speedier and are expected to order the X-Class with the forthcoming V6 diesel engine. It’s inside the cabin that the Mercedes is most car-like, with premium materials topping the dashboard including plenty of chrome details, stitched leather seating and equipment to keep you occupied. The four air vents stand out particularly, especially when aligned to create a line of X motifs, although as there are four of them I’m not sure what the message is meant to be… there are some cheaper and scratchier plastics around the lower half of the cabin but considering the working nature of the vehicle that’s to be expected. 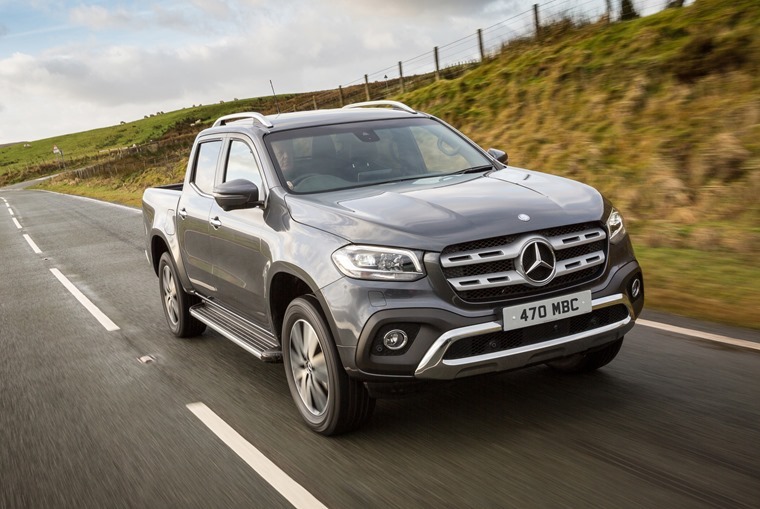 Overall the X-Class is a series of hits [and] high residual values are likely to keep leasing costs relatively low, while VAT can be claimed back for business purchases. There’s plenty of space for adults in the front or rear seats, but there is a disappointing lack of places to put everyday objects. Cubby holes and pockets are noticeable by their absence, making it difficult to even find a home for your mobile phone. At least there’s Bluetooth connectivity, a DAB radio, heated seats, reversing camera and cruise control across the entire range, with the Power spec tested here being loaded further with most conceivable options. Disappointingly, navigation is a £2,670 option, a pain that’s further compounded by the lack of Android Auto or Apple CarPlay. More impressively, safety equipment is standard across the range with even the entry-level Pure spec getting autonomous emergency braking, lane keeping assist and traffic sign recognition. Crash testing has gone well too, with EuroNCAP giving the X-Class a maximum five star safety rating. Overall the X-Class is a series of hits, with just the odd miss. However, at close to £41,000 that’s an awful lot of money for more than a handful of misses. Fortunately, while the headline price tag might be eye watering, there’s a lot that will make the X-Class more appealing financially. Firstly, high residual values are likely to keep leasing costs relatively low, while VAT can be claimed back for business. That one-tonne payload also means the HMRC sees the truck as a light commercial vehicle, which brings with it a fixed BIK rate and a company car tax bill of around £100 a month - less than you might pay for a mid-spec Ford Focus. All of this combines to make the X-Class a compelling choice. Private buyers don’t get it quite so good, as all the tax benefits are aimed squarely at business users, but these retail buyers are likely to value design and ability over straightforward financial benefits. The Mercedes hits the bullseye with both.